Avanti Resort is a shining beacon in the heart of activity and dining options on International Drive. 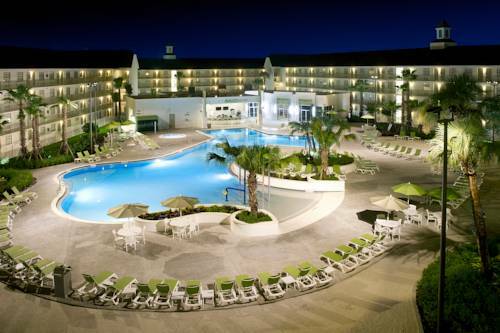 This resort features 652 comfortable and contemporary-style guest rooms and suites. The oversized pool features a kid s water play area- sandy beach volleyball and shuffleboard courts. Enjoy casual dining and beverage options at our poolside Bar and Grille. The lobby Barista serves Starbucks coffee along with pastries bagels and other grab-and-go items. The resort also features a fitness center game room and resort-wide WiFi. Avanti Resort is located within walking distance of a variety of dining and shopping and only a short ride on our shuttle away from major theme park attractions. A credit card is required at the time of booking in order to guarantee the reservation. In case of a no-show the credit card will be charged one night stay. Cancellation is required 24 hours in advance prior to arrival or penalty 1 nights room and tax will apply. Exceptions may apply - please see rate rules. The Barista Light breakfast and lunch sandwiches.